Little Africa, Pequena África in Portuguese, is an area in the Port Region of Rio de Janeiro that has historically been home to a strong Afro-Brazilian community. The area became known as Little Africa following the outlaw of the slave trade in Brazil in 1831 (though the abolition of slavery outright would not come for another 50 years). Between 1850 and 1920 freed slaves remained working in the area, and blacks and freed Africans from Bahia or the interior traveled to Little Africa in search of work and a sense of community. The area often welcomed blacks from all over the country with open arms. Houses, places to eat, to gather and practice African religions were established throughout the area. Despite this rich history, Rio’s African heritage and long history of slavery is all too often overlooked. Despite the renovation of the port area through the Porto Maravilha project and the creation of an African Heritage Circuit, the history of the sites remains largely unknown. 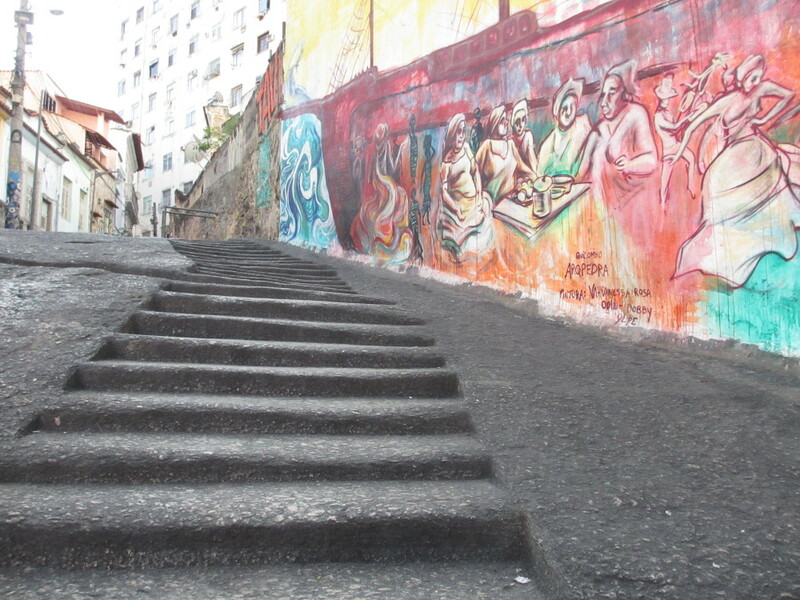 A popular samba spot for locals and tourists alike, Pedra do Sal is the oldest continually inhabited black neighborhood in Rio de Janeiro. The community was officially recognized as a quilombo in December 2005, and is a strong source of Afro-Brazilian culture. The area is widely credited as the birthplace of both samba and Carnival. The spot gets its name from the large stone (pedra in Portuguese) where salt (sal) and trades were sold when the bay reached its shores. The stone was used to dry salt and climbs up the side of the main square. Pedra do Sal may have been the first place ever to practice democracy in Brazil. Historian and researcher Sadakne Baroudi says that the community of Pedra do Sal formed its own government and voted their kings, queens and courts each year. This structure eventually became the samba schools of modern day Rio. The memory of Pedra do Sal is preserved by the residents of the thriving community, where traditions such as African-influenced religions like Candomblé and music run strong. Below Brazil’s first favela, Providência, the Rua do Valongo is a road that ran from Largo do Depósito, where enslaved Africans brought to Brazil via Rio were kept in fattening houses to increase their price at market until they were ready to be sold at the Valongo slave market. Houses and shops along this road were also used to sell slaves and reside them until they sold. Archeologists have discovered a wealth of household artifacts around the area that tell of daily life along the road. In 1906 a hanging garden was designed by the architect Luis Rei and built where the road once stood in an effort to remodel and “beautify” the city. It was designed to imitate the image of similar spaces in European metropoles, and even today holds classical-looking statues of Greek or Roman tradition, ignoring and whitewashing the history of oppression and violence that took place there. The hanging garden was recently renovated by the City as part of the Porto Maravilha project, and an information board with its history displayed. However many view this as an inadequate testament to the brutality that took place here. The construction of the Black Church, the Church of Our Lady of the Rosary and Saint Benedict, in the place where it now stands began in 1700, and was finished in 1737. 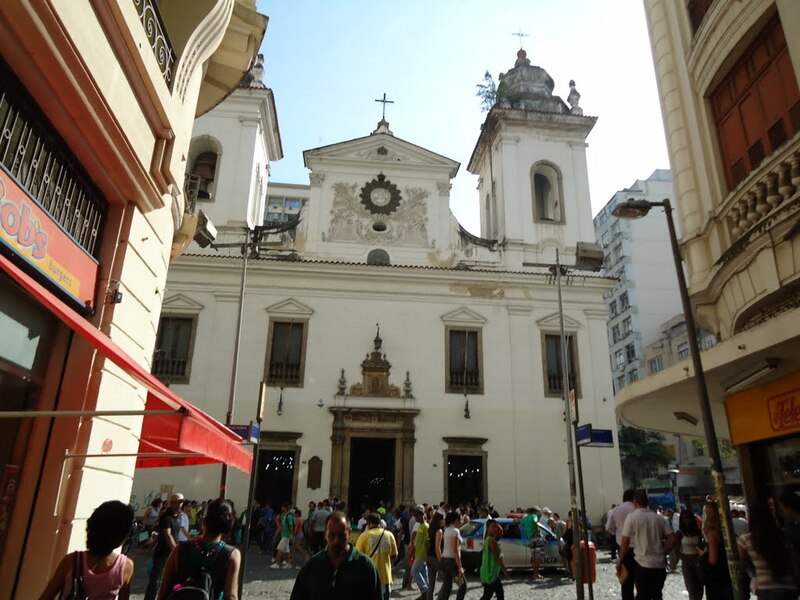 It is an important center of Afro-Brazilian religion and political and social life. 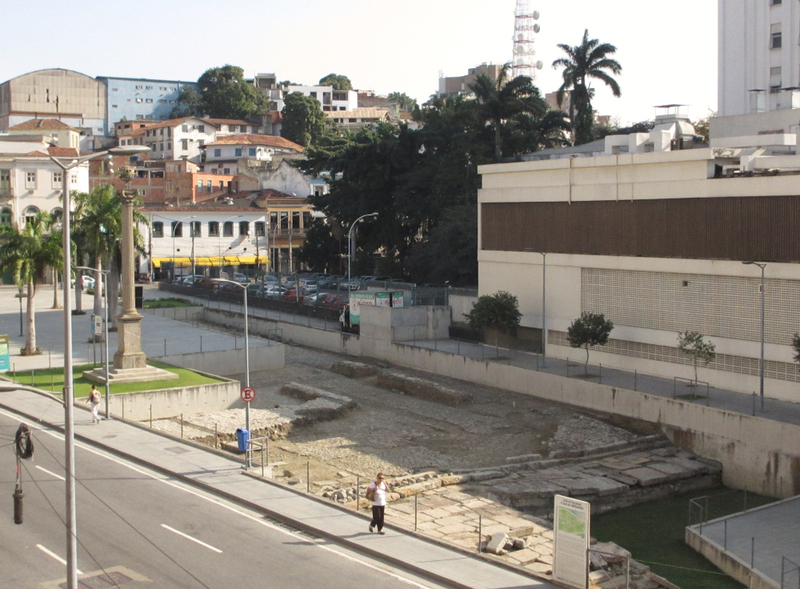 It was the site of the first political protest in Brazil in 1822. In 1967 the Black Church and Museum that it also houses were ravaged by a fire. The building still stands and is open to the public, though it is sparsely decorated. 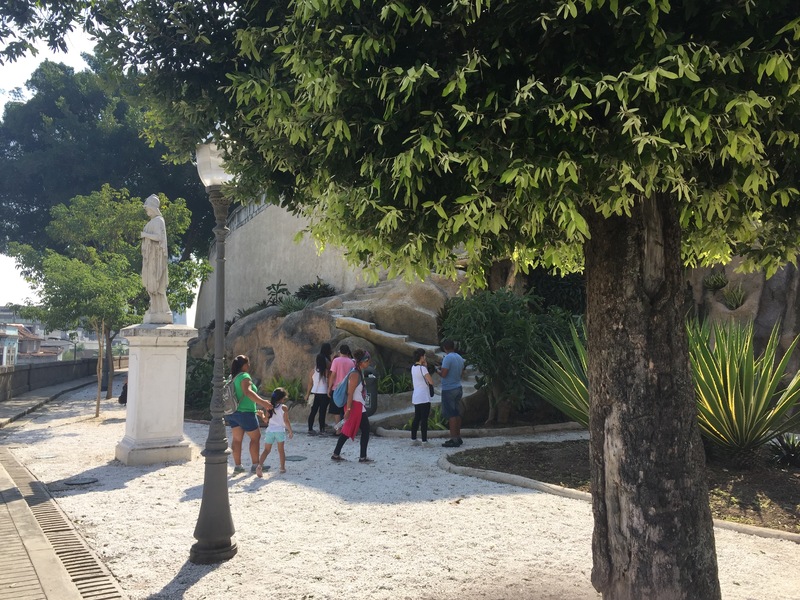 Many important Afro-Brazilian figures are said to be buried here, including Anastasia, a slave woman popularly venerated as a saint in Brazil. Although the Catholic Church denies her existence after claiming to find no remains on the site during the renovation after the fire, and removed her image from all church owned properties, she remains an important figure of worship for Brazilian catholics and followers of Afro-Brazilian religions such as Umbanda. When enslaved Africans arrived from the journey across the Atlantic they were often malnourished, ill and injured. They could not be sold in this condition, and so were kept in “fattening houses” where they were fed to increase their market value. Largo do Depósito, today known as Praça dos Estivadores, was the center of these warehouses where slaves were kept, fattened, and prepared to be sold. 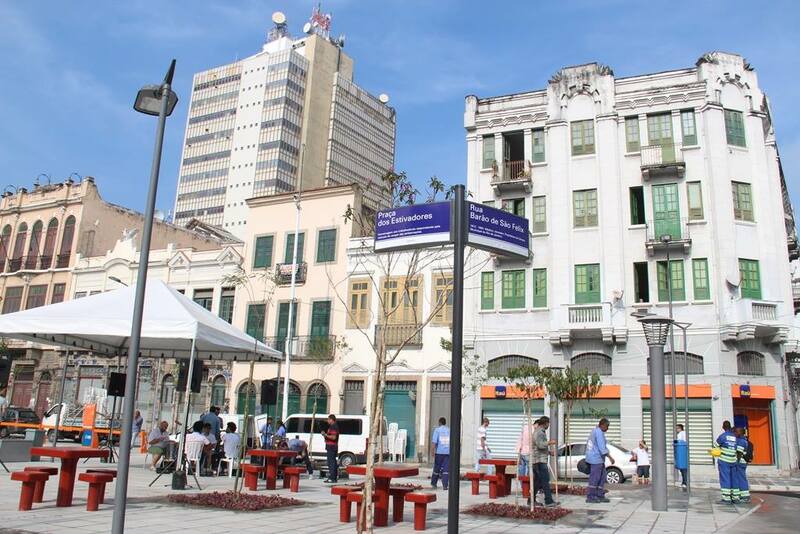 Today Largo do Deposito is a stop on the Porto Maravilha heritage tour. 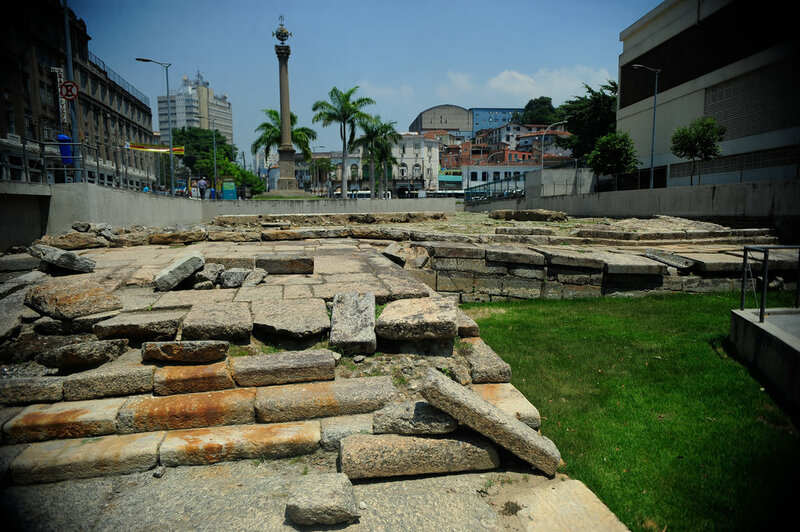 The archaeological remains of Cais do Valongo, or Valongo Wharf, located in the center of Little Africa, mark what was once Rio de Janeiro’s most active slave market. Over the course of its operation between 1774 and 1831 an estimated 500,000 to 700,000 enslaved and captured African men and women ended their forced journey across the Atlantic Ocean at Valongo Wharf. The transatlantic slave trade was outlawed in 1831 and Valongo Wharf was officially closed, although slave trade continued illegally in Brazil for the following decade and slavery was not abolished until 1888. Since its construction, the Valongo Wharf was meant to hide the slave market from Rio de Janeiro’s elite, who were concerned about contracting diseases and did not want to face the ugliness of the slave trade. In the 1700s the majority of the captured men, women, and children were brought to Rio de Janeiro’s commercial city center near what is today Praça XV. In 1774 the point of slave trade disembarkment was moved to the Valongo bay area, after years of complaints from elites. In 1843, the city of Rio de Janeiro built over Valongo Wharf in order to erase the memory of the slave trade and create a new port of entry for Italian Princess Tereza Cristina de Bourbon, the wife of Emperor Don Pedro II. The street name was changed from Rua do Valongo to Rua da Imperatriz. Again, between 1904 and 1910 the city built a large landfill on top of the Wharf, further burying the history of Rio de Janeiro’s slave trade. The landfill made up part of the Port Region which is now Praça Mauá. When the Porto Maravilha redevelopment project began in 2009, the Institute of National Artistic and Historic Heritage (IPHAN) was approved to conduct an archeological research study in the area where the Valongo Wharf was thought to be. In 2011 the project revealed the multiple layers of the Valongo Wharf and various artifacts brought over by the enslaved Africans. Tania Andrade Lima, archaeologist of the Rio de Janeiro Federal University’s National Museum, stated: “Valongo reeks of extreme oppression, racism, intolerance, inequality and marginalization. It conjures up a heavy and oppressive past, whose consequences are felt to this day and will be felt for a long time yet in Brazil. 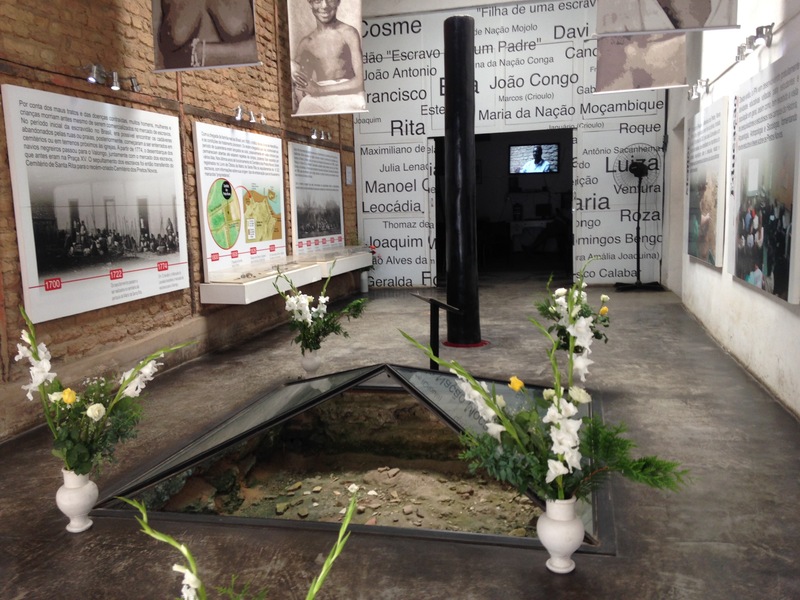 Very close to Valongo Wharf is the Cemitério Pretos Novos, or the New Blacks Cemetery, where between 20,000 to 30,000 captured and enslaved men and women that did not survive the forced voyage from Africa to Rio de Janeiro or died shortly after arrival were buried. The bodies were crushed and thrown into a mass grave along with trash, such as broken pottery and chicken bones. The New Blacks Cemetery is considered to be the largest slave cemetery in the Americas. The cemetery is first shown in maps dating back to 1791. The cemetery was closed in 1831, as the slave trade formally ended in Brazil. Similar to the Valongo Wharf, the cemetery was built on top of and covered by housing and urban development over the years. It was not until 1996 that the cemetery was rediscovered when a couple that was restoring their house found human bones underneath it. After this discovery IPHAN conducted archaeological research in the area and an important research institute has been established on the site. To explore Rio’s Port and Little Africa, read more here and take the Afro-Rio Walking Tour. This article was written by Mariah Barber, Rhona Mackay, and published on June 3, 2016.